Students pack the library for a teen court session at John Burroughs High School in Los Angeles. 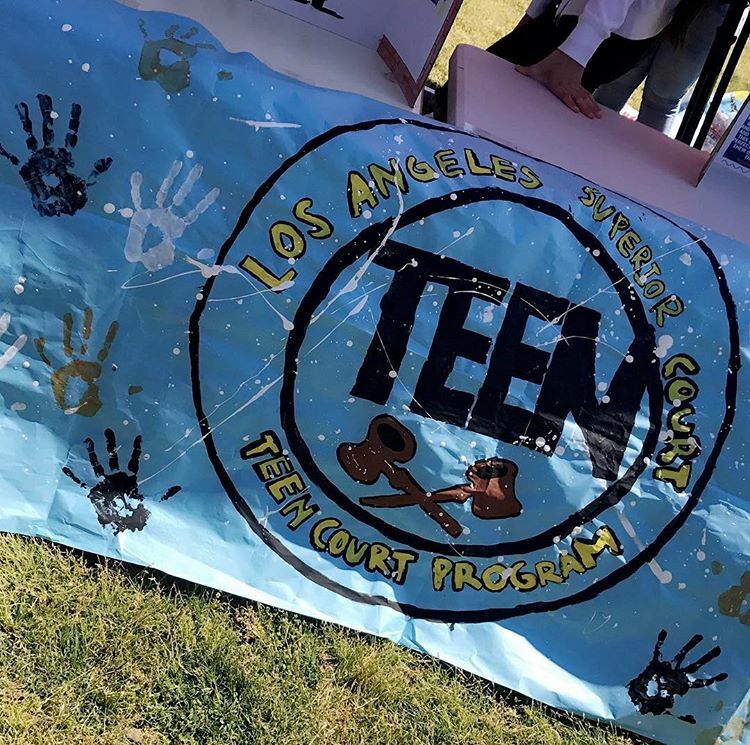 Los Angeles County operates an award-winning teen court program that hears 1,000 cases annually. At Natomas Pacific Pathways Prep, peer court holds sessions in a student-built courtroom on campus. California’s 75 teen courts let youth face a jury of their peers – and steer cases away from the juvenile justice system. In Los Angeles teen courts, crowds are standing room only and judges sit on a waitlist to preside over cases. Here, young people–mostly first-time offenders accused of minor crimes–can avoid juvenile court by facing justice handed down by their peers. When Los Angeles County Superior Court Judge David S. Wesley founded the first teen court in Los Angeles 25 years ago, he was unsure students would buy in. “What we soon found out was the students never stopped talking about it on campus,” Wesley said. He has since spearheaded the opening of 40 more teen courts in Los Angeles high schools that hear 1,000 cases annually, and rising. California once disproportionately incarcerated its youth, but the rate of juveniles in custody has plummeted to its lowest level since 1960. Wesley said early intervention programs, including youth courts, have played a role. Statewide, there are now 75 teen courts, also called youth courts–a sharp rise since 1991 when just two were in operation. "It holds them appropriately accountable, but it doesn’t brand them an offender for life." Under a judge’s guidance, youth courts aim to repair harm to victims and the community by doling out sentences of community service, letters of apology and programs such as counseling or alcohol treatment. Former defendants must return to serve as jurors on future cases. “They come in as a defendant and leave as a constructive community member,” said Donna Strobel of the Judicial Council Center for Families, Children & the Courts. “Youth courts are an empowering experience." 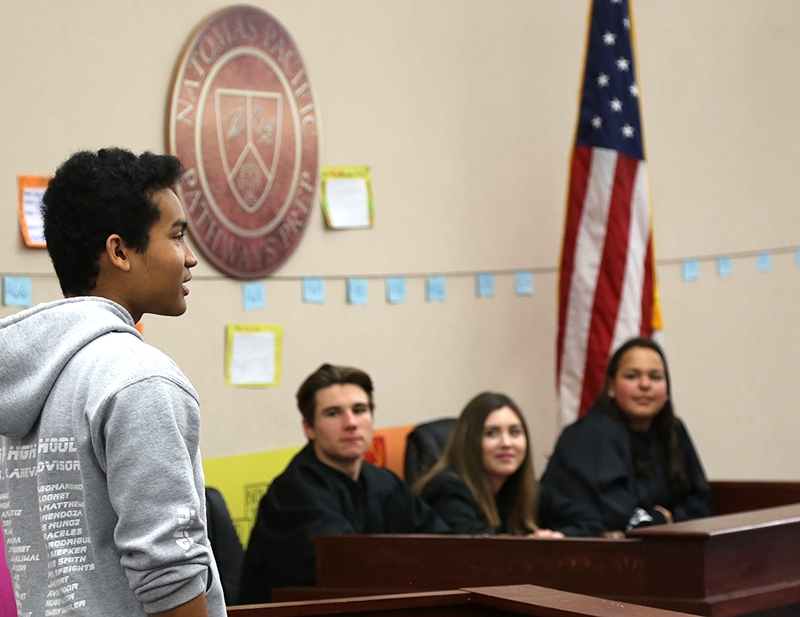 At Natomas Pacific Pathways Prep, peer court operates in a student-built courtroom on campus. Youth courts help ease court caseloads by keeping low-level offenders out of the system. And court leaders say former defendants are unlikely to commit crimes again; anecdotal evidence suggests just 5 to 8 percent will re-offend. For many youth, being held accountable by their peers carries more weight than disapproval from an adult authority figure, advocates say. “We are diverting kids who should be diverted from the juvenile justice system–that lowers our caseload so we can focus on more serious offenders,” said retired Placer County Superior Court Judge J. Richard Couzens, who helped launch that county’s youth court in 1990. For other students, a passion for civic involvement and the law drives them to volunteer in youth court. High school sophomore Gabrielle Battle credits her experience in Oakland’s youth court with fueling her desire to become a civil rights attorney. Among her cases: a girl who stole makeup to prepare for a piano recital. Student jurors of the San Bernardino Youth Court take an oath. Later this month, 300 youth court participants will converge in Redlands for an annual training and educational summit hosted by the California Association of Youth Courts and the Judicial Council’s Collaborative Justice Courts Advisory Committee. Participants will include successful graduates of the San Bernardino Youth Court, established in 2015 amid concerns that suspension and expulsion rates were forcing too many students out of local schools, feeding the “school-to-prison” pipeline. In its second year, the San Bernardino court handled 128 cases that would have once sent students to the principal’s office to be suspended or expelled–or worse, to juvenile hall.